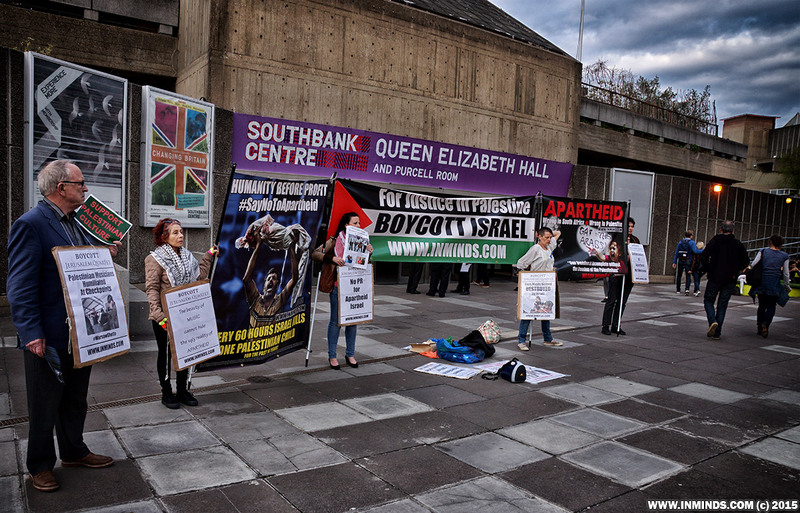 On 24th April 2015 activists protested the performance of Israel's cultural ambassadors, the Jerusalem Quartet, at the Queen Elizabath Hall in the Southbank, London. 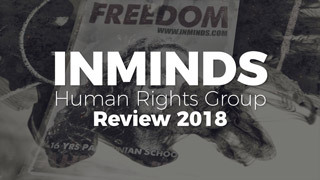 The highly successful action, organised by Inminds, saw activists from as far a field as York, Cambridge and Brighton join local London activists, all united against Israel's multi-million dollar 'Brand Israel' project of using culture to whitewash crimes against the Palestinian people. 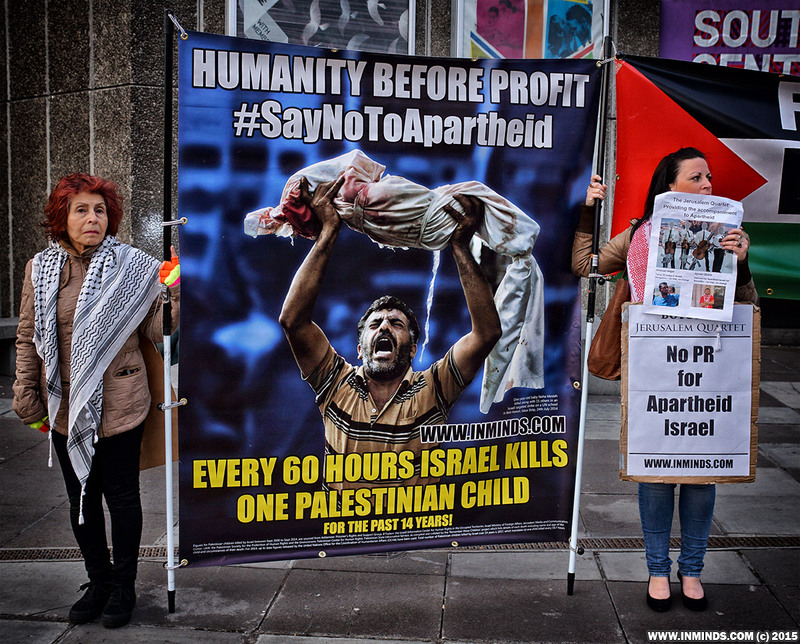 The protest outside was complimented with disruptions inside the hall as activists charged the Jerusalem Quartet with complicity in Israeli war crimes. 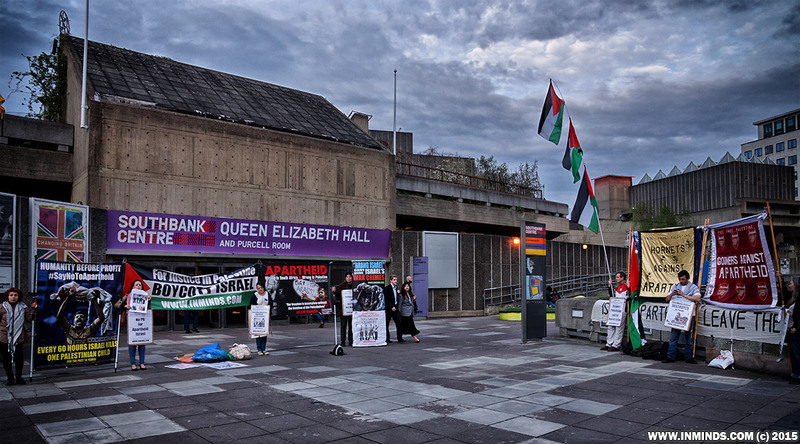 The venue - Queen Elizabeth Hall, located on the south bank of the river Thames is a great location to engage with people explaining to them the Palestinian call for a cultural boycott of Israel and how the Jerusalem Quartet, proudly boasting of their links to the Israeli occupation army, are poster boys for Israeli apartheid and should be boycotted. 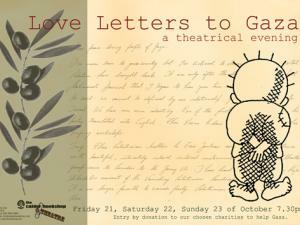 Many people attending other arts functions at the Hall were very sympathetic and showed great support for the protest. 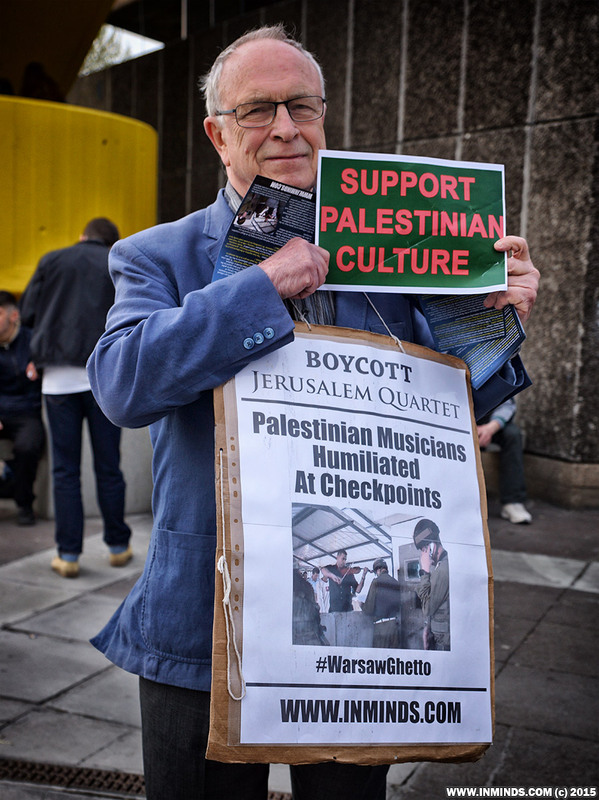 One musician, shocked at the humiliating treatment of fellow musicians at Israeli occupation checkpoints, offered his services should we need any music composed! Even those entering the Hall to attend the concert readily took our leaflets, promising to educate themselves with the issues. 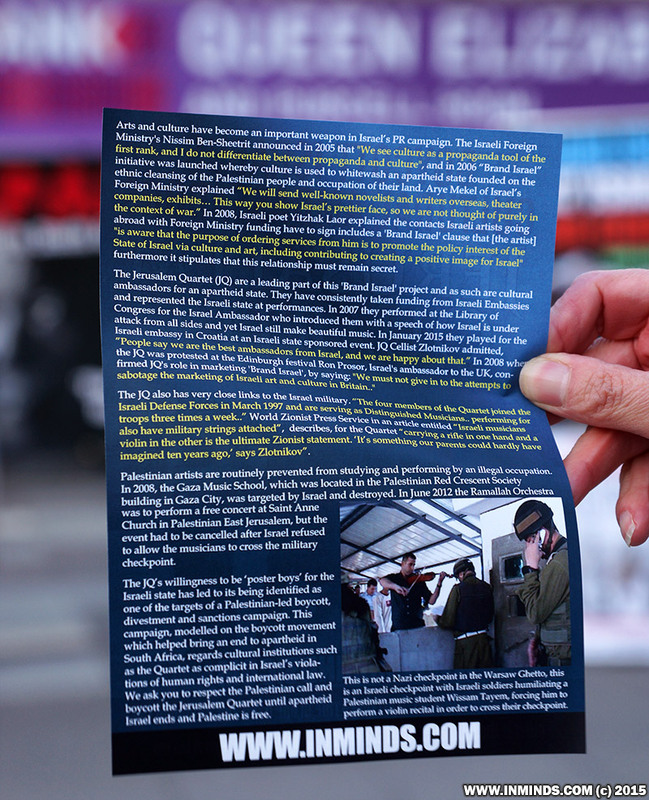 Around 500 leaflets were given out in a short period of time. 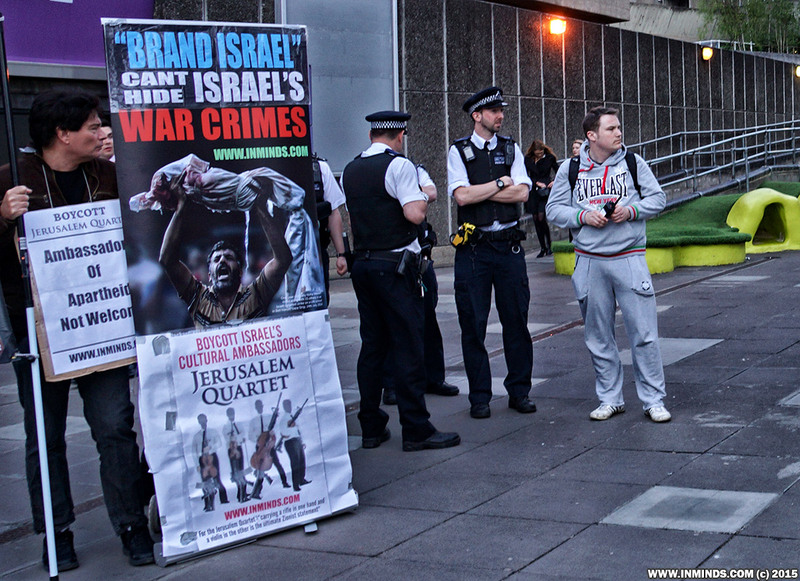 We only encountered one zionist, a nasty apologist for Israeli war crimes against Palestinian children. 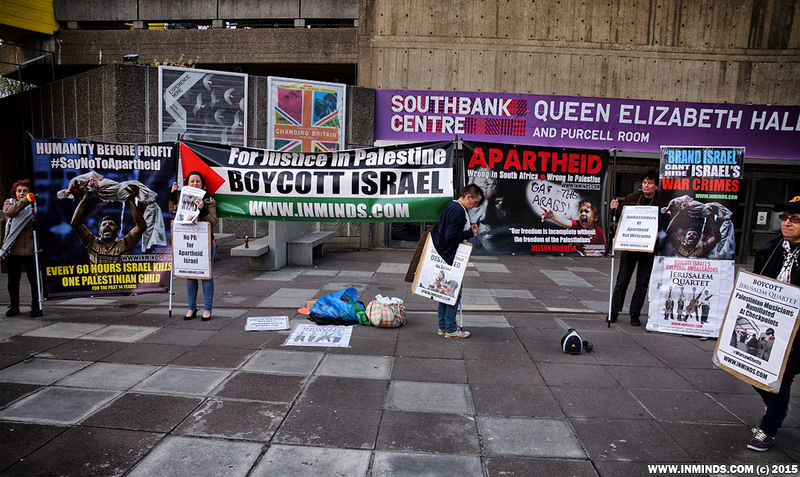 Their strategy is always the same, they have nothing to contribute to the debate but are there simply to disrupt our engagement with the public, to prevent us from sharing the truth with our fellow londoners. 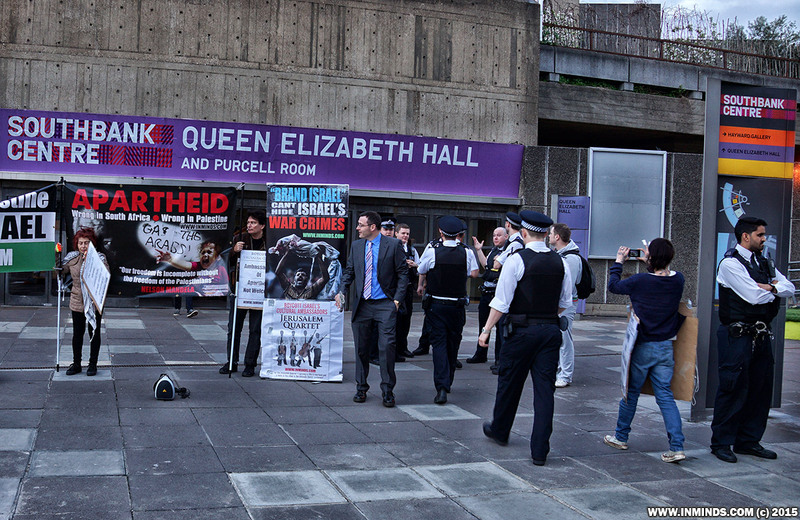 Whilst we protested outside some activists bought tickets and took the protest inside the concert hall. 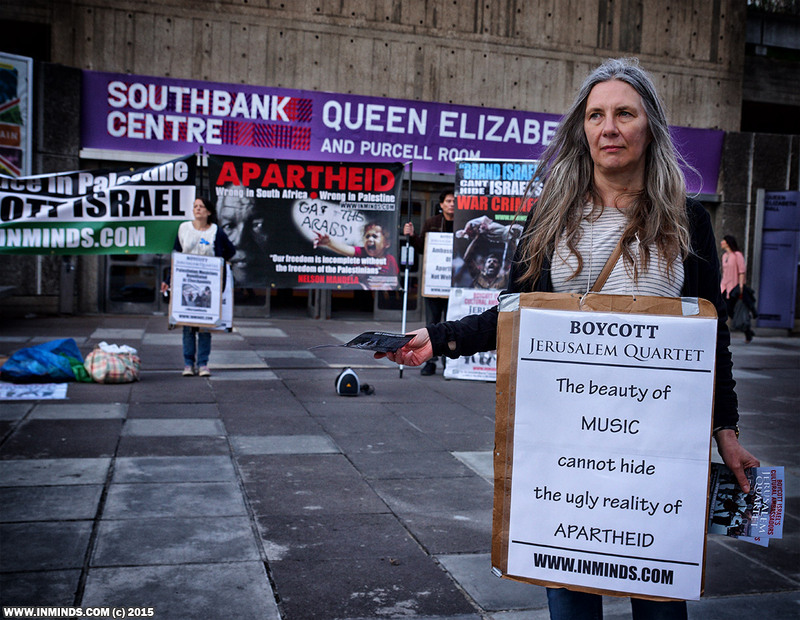 They magnificently derailed the concert by their interjections from the back of the hall "Jerusalem is occupied and this Quartet is complicit in Israeli war crimes".. "there is a connection between these players and the slaughter of over 2,000 men, women and children in Gaza last August. 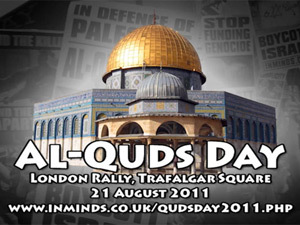 The Quartet deny this connection because that is what Israel tells them to do, but the connection is strong".. etc. before being escorted out. (see their account below including video). 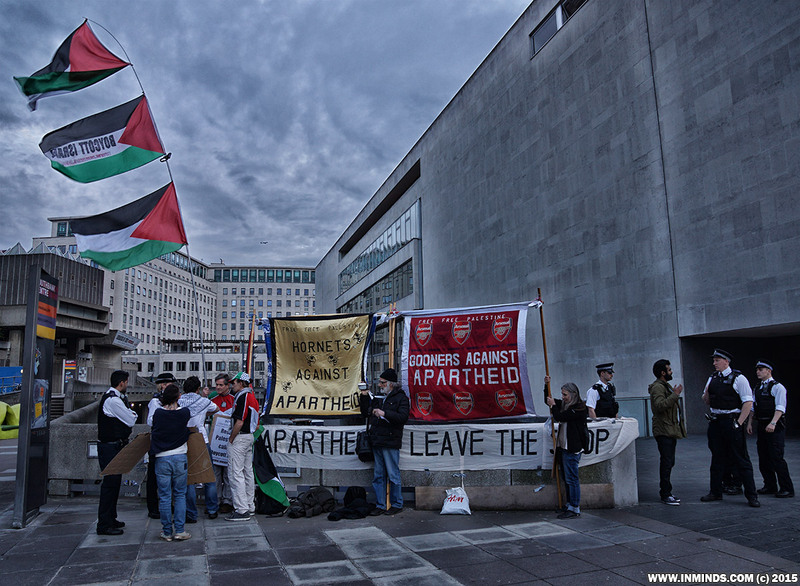 The private security were not particularly helpful and one guard in particular from inside the Hall took it upon himself to police the protest outside the Hall. 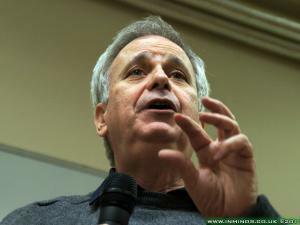 He tried to stop our speakers from speaking and kept taking down our posters from the walls. We explained to him that he was not a policeman and had no right to disrupt our protest and if he felt we were breaking any laws by protesting outside the Hall then he was welcome to call the police. Soon around 20 policeman turned up. 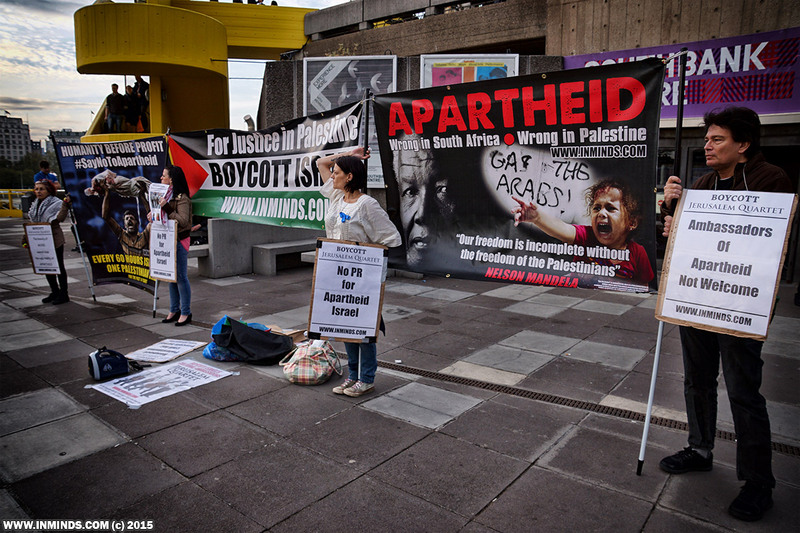 They were reasonable and upheld our right to protest against the performance, and were quiet taken aback when told how the security guard had tried to stop free speech. There were three suspicious characters in plain cloths with police grade comms equipment lurking about from before the police arrived, they were spotted liaising with the police when they came and they stayed spying on us long after the police had gone.. people did speculate if they were working for the Israeli embassy or the private zionist security force, the CST? Due to the bullying of the private security and the great response from the public we decided to extend the protest by an extra 30 minutes. 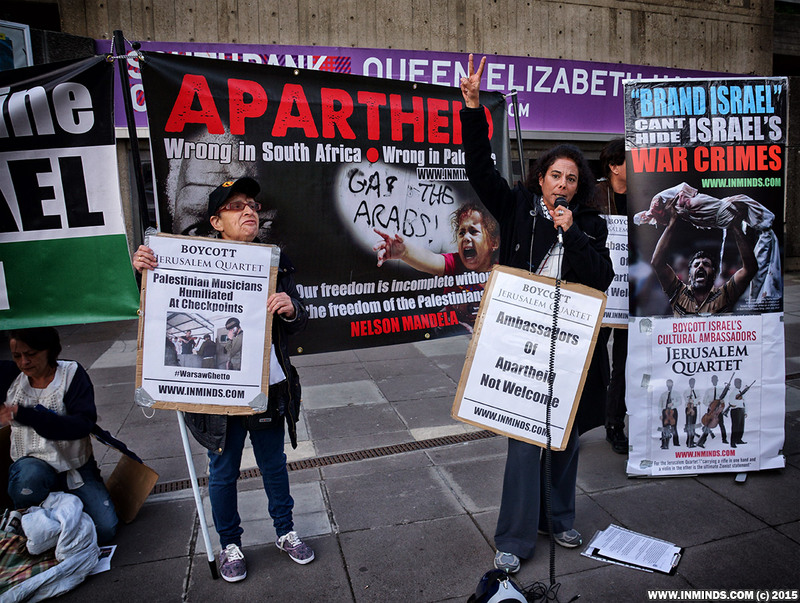 It was a very effective protest delivering a strong message to Israel that their cultural ambassadors are not welcome in our city and any attempt to whitewash Israeli crimes with 'brand Israel' will backfire with Londoners learning more about apartheid Israel than if they had not come. 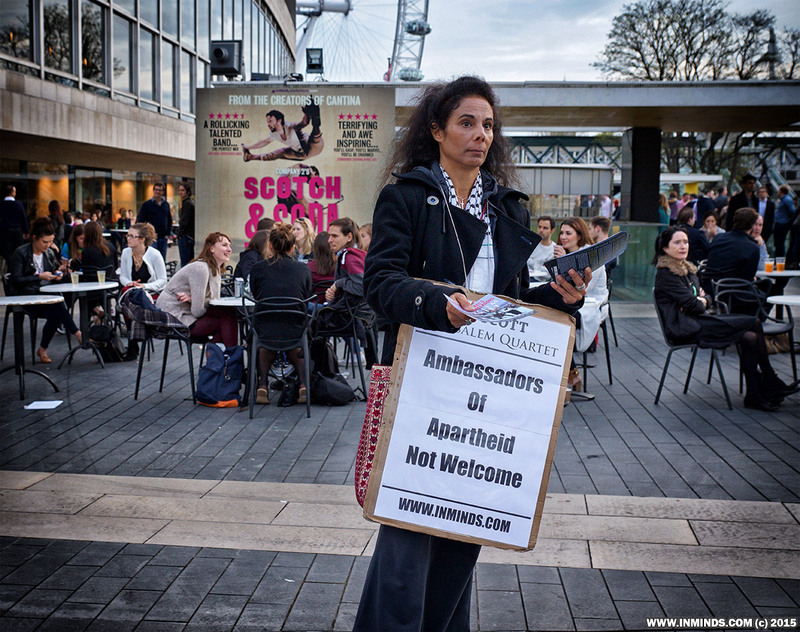 We are here today outside the Queen Elizabeth hall in the Southbank Centre to ask Londoners to reject the cultural ambassadors of apartheid and to boycott the Jerusalem Quartet's performance today. 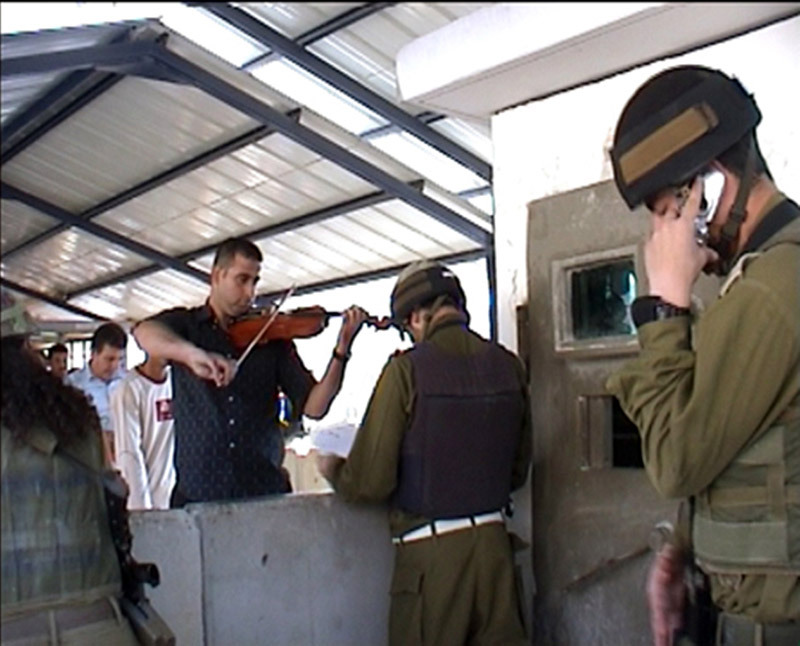 forcing him to perform a violin recital in order to cross their checkpoint. 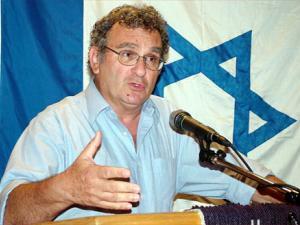 In 2008, Israeli poet Yitzhak Laor explained the contacts Israeli artists going abroad with foreign Ministry funding have to sign. 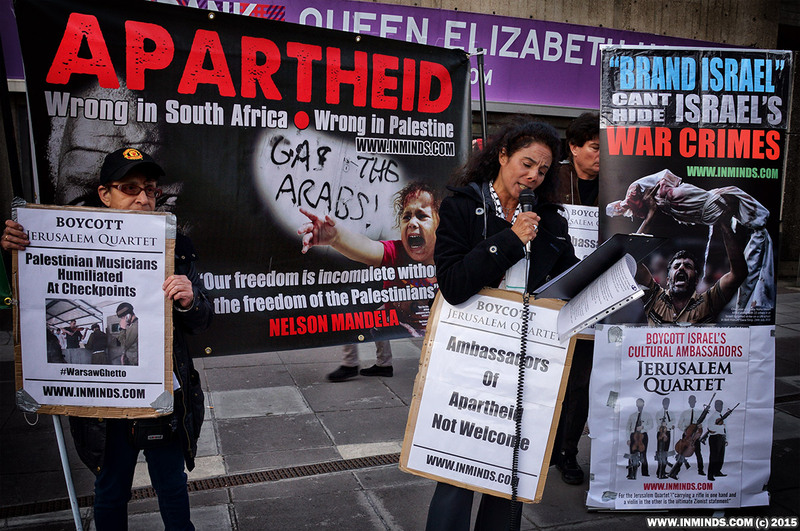 They specifically include a 'Brand Israel' clause that states that [the artist] "is aware that the purpose of ordering services from him is to promote the policy interest of the State of Israel via culture and art, including contributing to creating a positive image for Israel" furthermore it stipulates that this relationship must remain secret. 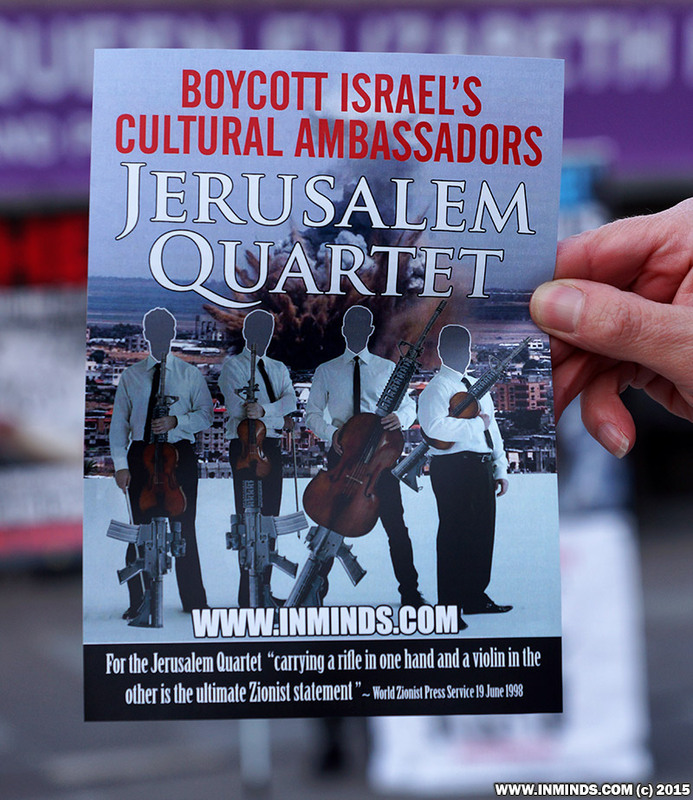 The Jerusalem Quartet are a leading part of this 'Brand Israel' project and as such are cultural ambassadors for an apartheid state. 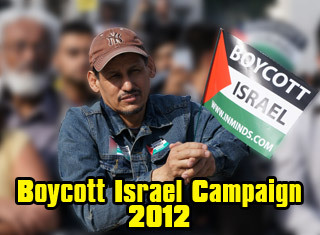 They have consistently taken funding from Israeli Embassies and represented the Israeli state at performances. In 2007 they performed at the Library of Congress for the Israel Ambassador who introduced them with a speech of how Israel is under attack from all sides and yet Israel still make beautiful music. 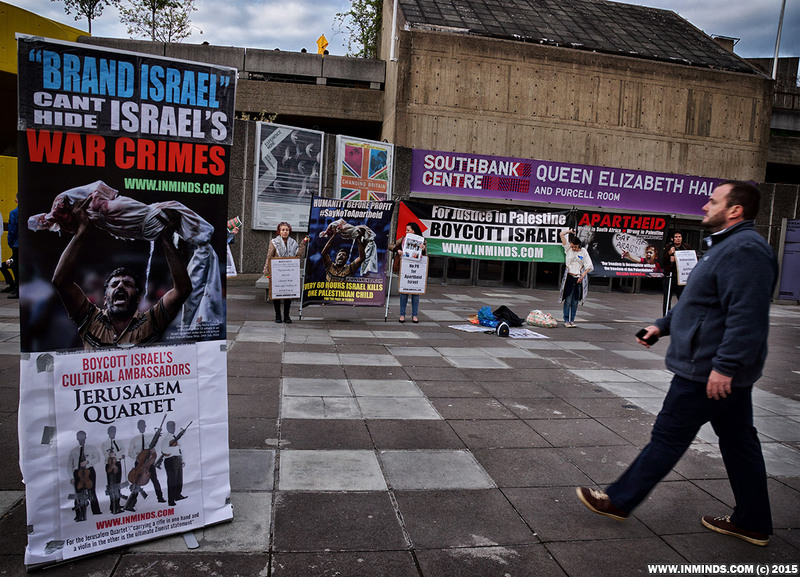 In Sept 2008 when the Jerusalem Quartet was protested at during the Edinburgh festival, Ron Prosor, Israel's ambassador to the UK, confirmed Jerusalem Quartet 's role in marketing 'Brand Israel', by saying: "We must not give in to the attempts to sabotage the marketing of Israeli art and culture in Britain.."
The Jerusalem Quartet also has very close links to the Israel military. 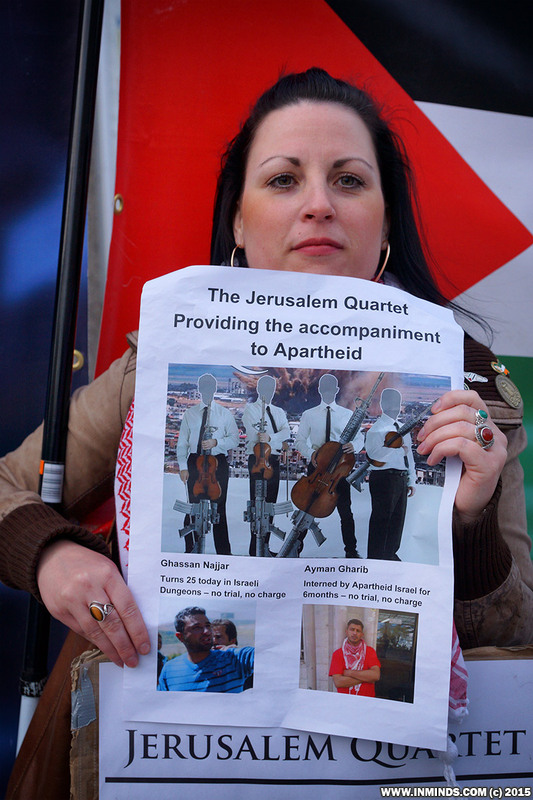 Their website boasted that “The four members of the Quartet joined the Israeli Defense Forces in March 1997 and are serving as Distinguished Musicians.” An article by the World Zionist Press Service in 1998, entitled “Israeli musicians also have military strings attached”, described how since completing their military service: “The Quartet now serves as Distinguished Musicians, performing for troops three times a week. 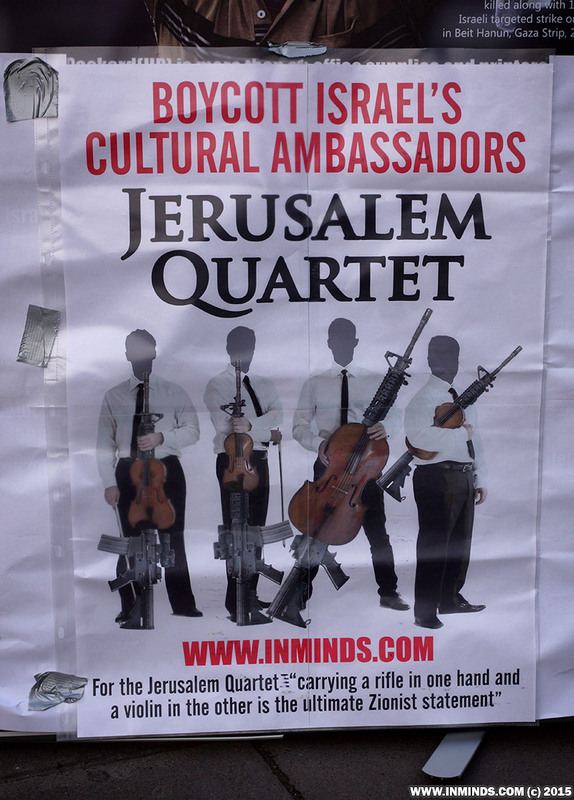 … For the three immigrants, carrying a rifle in one hand and a violin in the other is the ultimate Zionist statement. 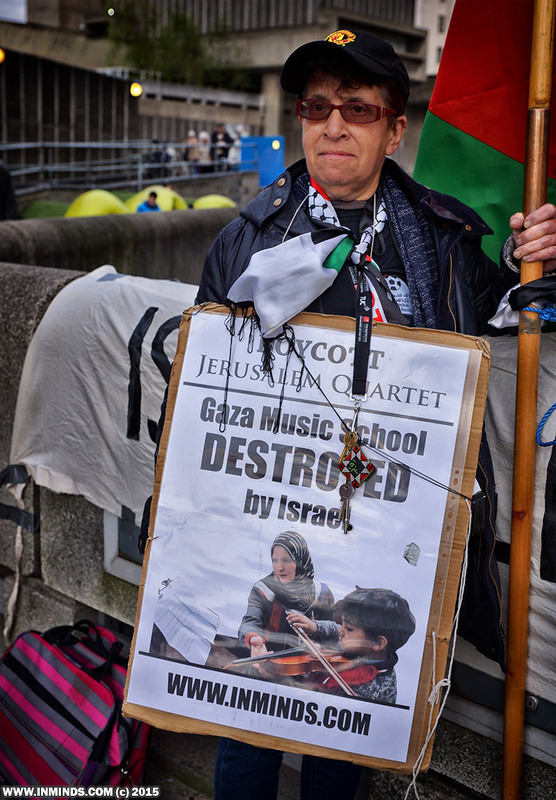 ‘It’s something our parents could hardly have imagined ten years ago,’ says the Jerusalem Quartets Cellist Kyril Zlotnikov”. 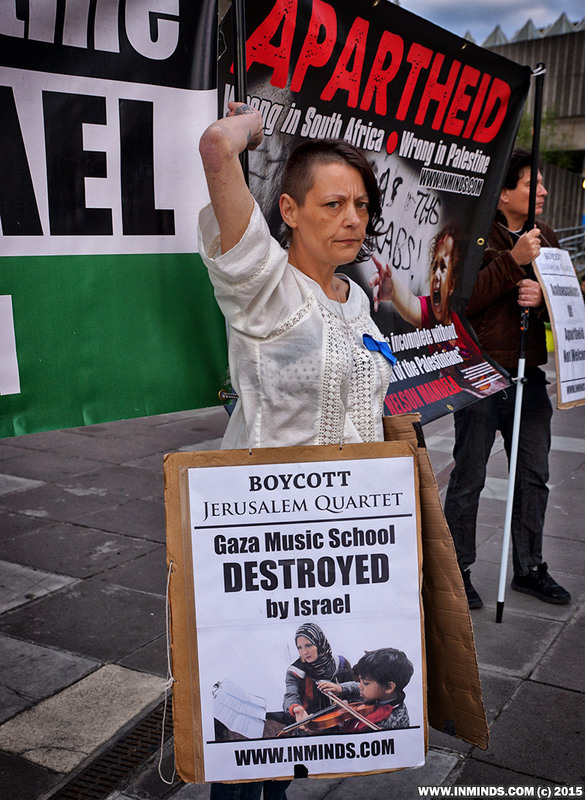 On the other hand, Palestinian artists and musicians are routinely prevented from studying, rehearsing and performing by an illegal occupation. 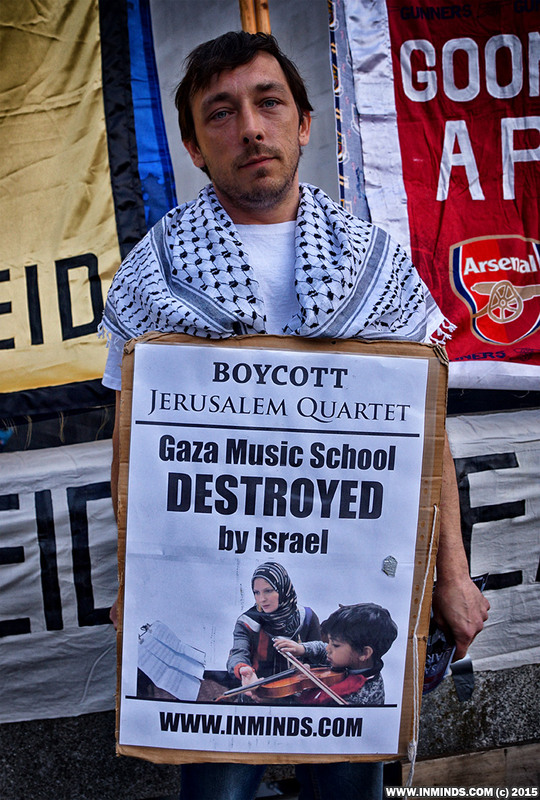 In 2008, the Gaza Music School, which was located in the Palestinian Red Crescent Society building in Gaza City, was targeted by Israel and destroyed. 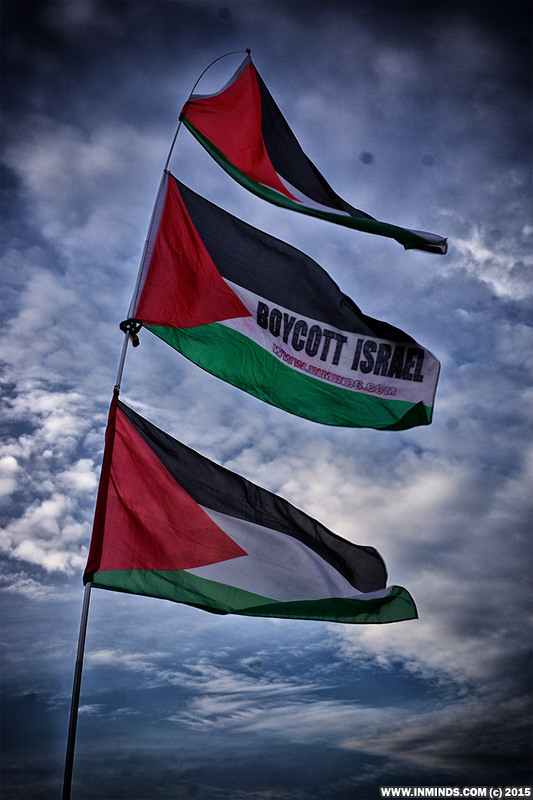 In June 2012 the Ramallah Orchestra was to perform a free concert at Saint Anne Church in Palestinian East Jerusalem, organized with the assistance of the French Consulate, but the event had to be cancelled after Israel refused to allow the musicians to cross the military checkpoint. 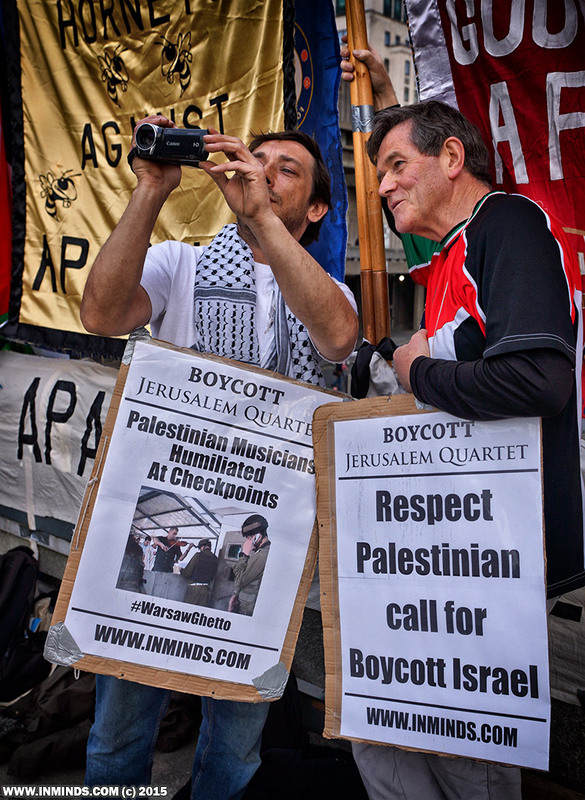 And we have all seen photos of how Palestinian musicians are harassed and humiliated at checkpoints, forced to perform at gun point for Israeli soldiers who mock and laugh at them. No, this is not a photo of the Warsaw Ghetto, this is not Nazi soldiers humiliating a Jewish musician, this is an Israeli checkpoint with Israeli soldiers humiliating a Palestinian music student Wissam Tayem, forcing him to perform a violin recital in order to cross their checkpoint. 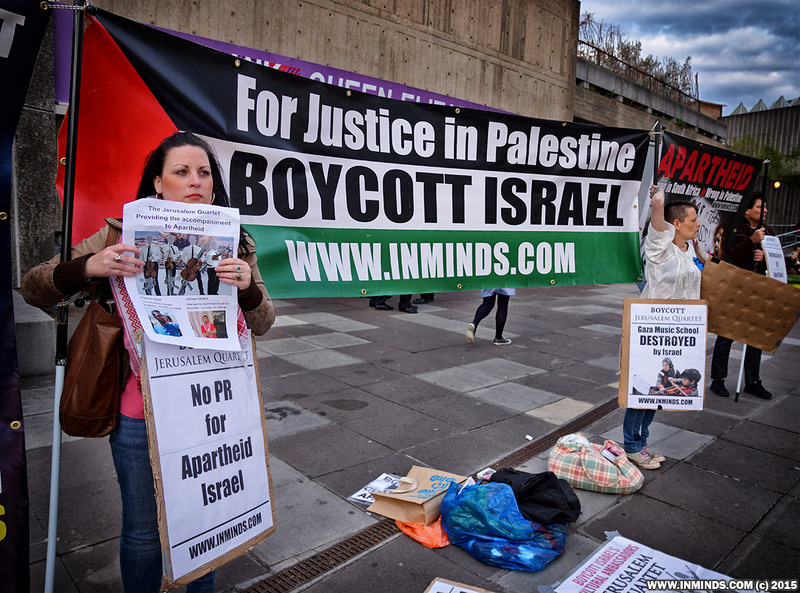 The Jerusalem Quartet’s willingness to be ‘poster boys’ for the Israeli state has led to its being identified as one of the targets of a Palestinian-led boycott, divestment and sanctions campaign. 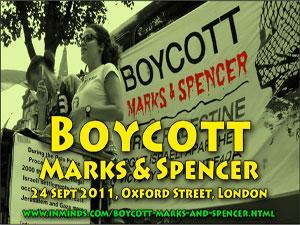 This campaign is modelled on the boycott movement which helped bring an end to apartheid in South Africa. 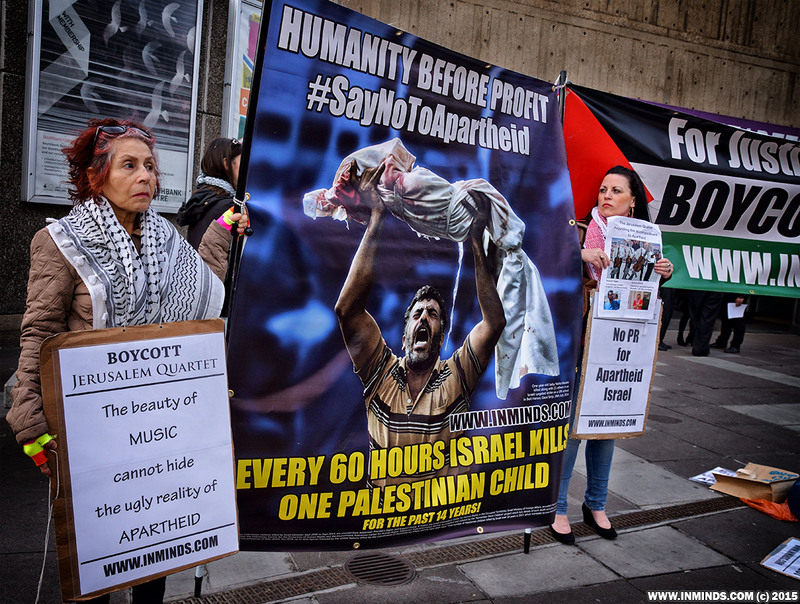 It regards cultural institutions such as the Quartet as complicit in Israel’s violations of human rights and international law. 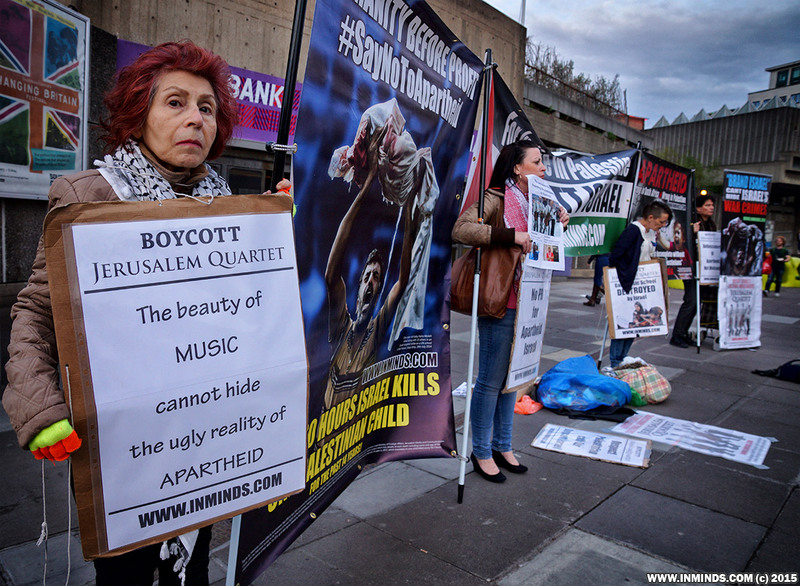 The beauty of music cannot hide the ugly reality of apartheid. 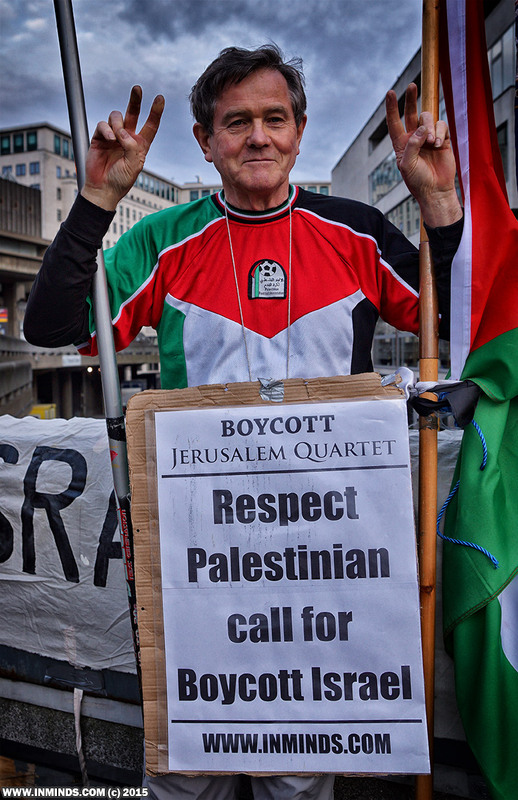 We ask you to respect the Palestinian call and boycott the Jerusalem Quartet until apartheid Israel ends and Palestine is free. T and I decided to go inside- plenty of the cheapest seats (- £10) were still available when we bought our tickets just before the performance. These put us right near the back and to one side and this was probably the best position we could have been in, given that the hall has steeply raked seats. Total capacity of the hall is 900, of which two thirds to three quarters were taken. 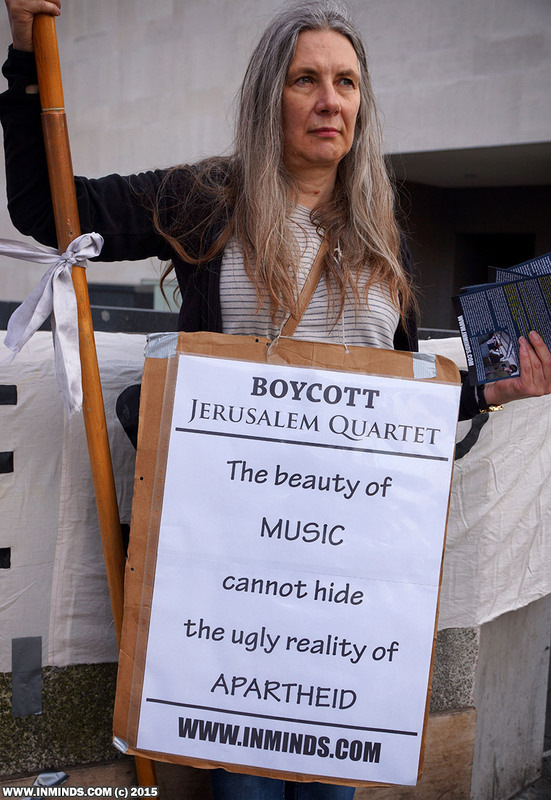 We allowed the first movement of the first piece (- a Mozart Quartet) to pass by undisturbed, and the playing came across to me as tired, mechanical and disengaged; maybe all those years of promoting Brand Israel has worn them down and compromised the high standards they once achieved. 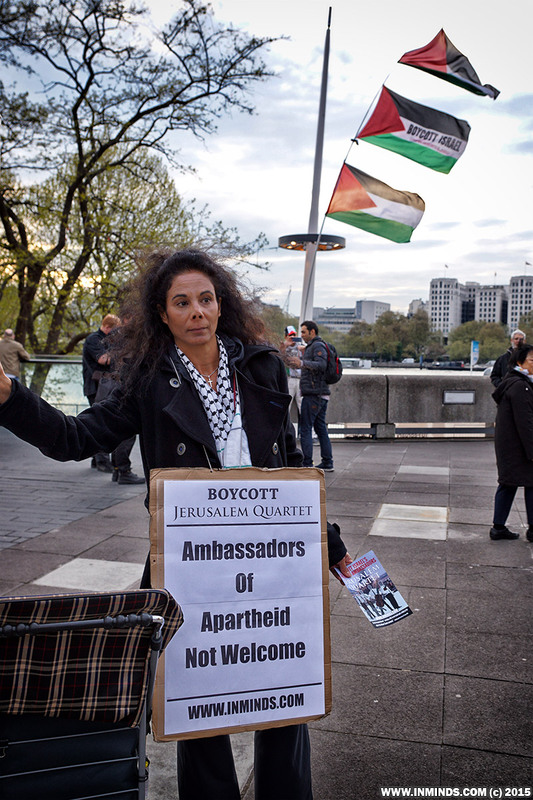 'Jerusalem is occupied and this Quartet is complicit in Israeli war crimes'. 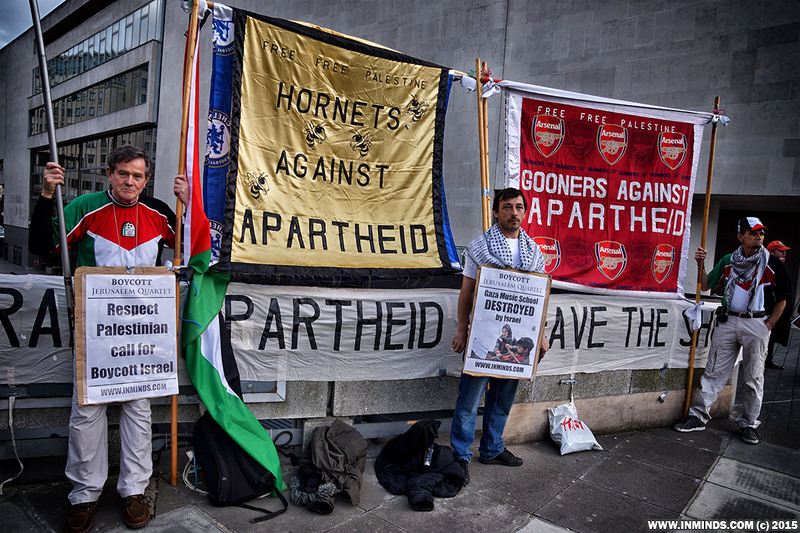 'there is a connection between these players and the slaughter of over 2,000 men, women and children in Gaza last August. 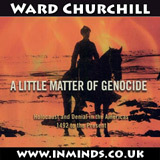 The Quartet deny this connection because that is what Israel tells them to do, but the connection is strong'. By now, all heads in the hall were turned away from the stage and up at us in the top left hand corner of the hall. 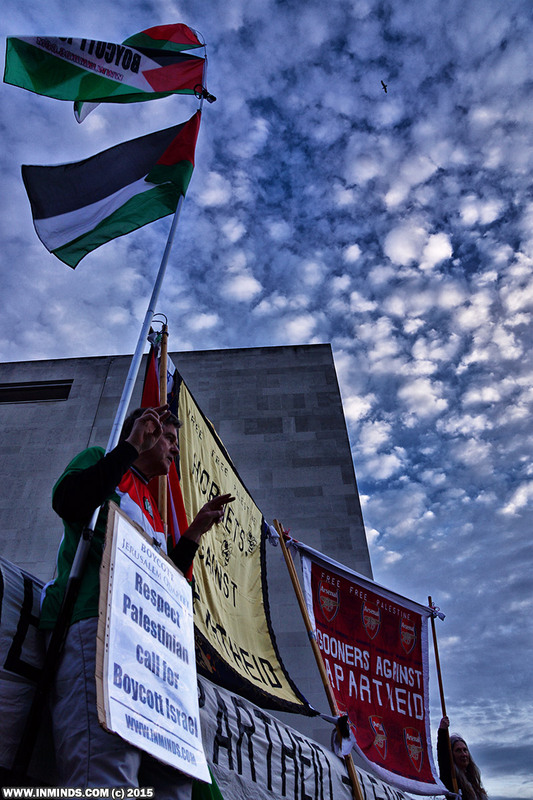 We had free rein to make quite a few more Palestine-related comments before the stewards again asked us politely to leave. They accompanied us (- without actually holding us) as we made our way slowly down the long gangway to the exit. 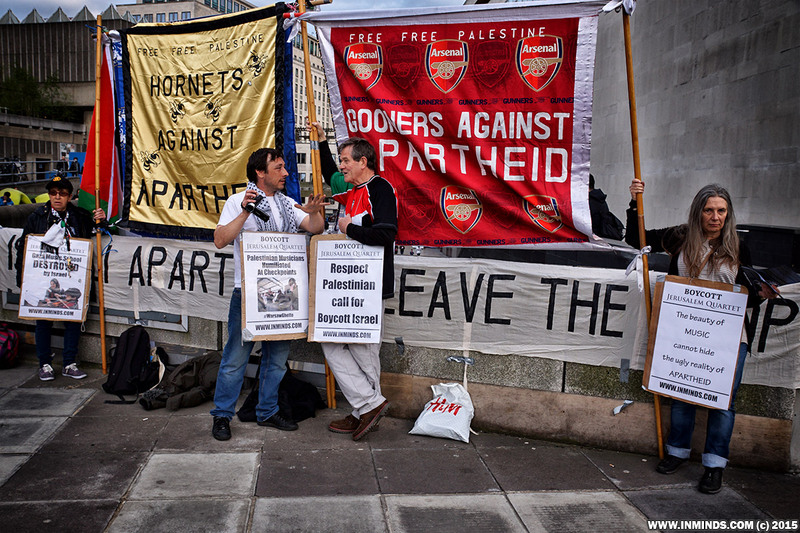 We both made more of the 'Free Palestine' type of remarks as we went, and I particularly recall saying 'please think carefully before you come to listen to this lot again!' There were a few abusive comments from members of the audience- some from the far corners of the hall. And I saw one V-sign. 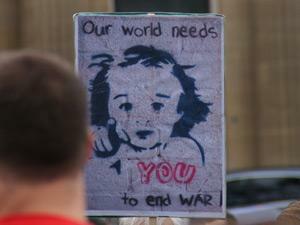 But the reaction was generally restrained which gave us the maximum opportunity to make ourselves heard. T and I had considered using one of our phones to take a video of the action inside, but decided not to- I think this was the right choice as it meant that the audience could see that we were doing this especially for THEM, rather than some third party they might never know about... Hence my attempt to describe the action in words. If we'd had a third person, then maybe we could suitably have videoed it. Who is the man in the tracksuit with police grade comms equipment? Apparently he was there before the police arrived and stayed to spy on the protest after the police had left.